The May 3, 2018, eruption of Kilauea Volcano on the island of Hawaii created a number of gas-spewing and lava-oozing fissures in the volcano’s East Rift Zone. Lava flows and high levels of sulfur dioxide gas prompted evacuations in the area, including the Leilani Estates subdivision near the town of Pahoa. The fissures can be seen in an image acquired May 6, 2018, by the Advanced Spaceborne Thermal Emission and Reflection Radiometer (ASTER) instrument on NASA’s Terra spacecraft. Red areas in the image are vegetation, and gray areas are old lava flows. 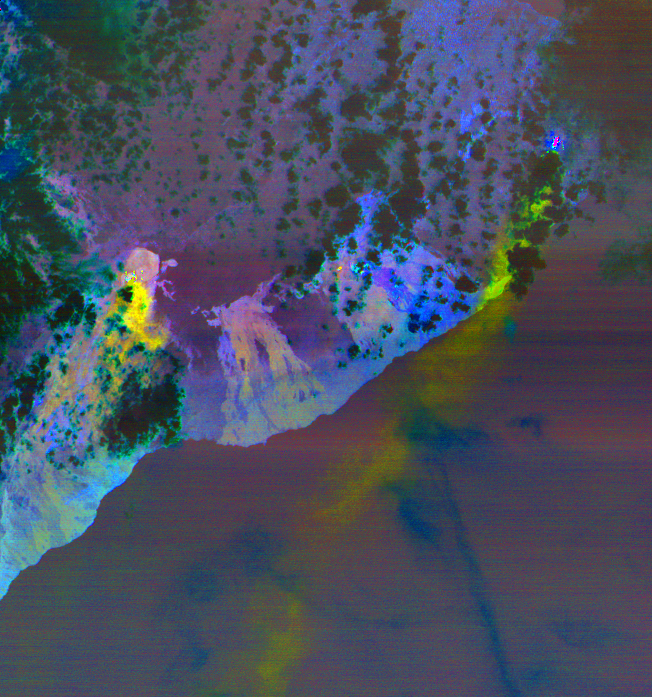 Yellow areas superimposed on the mage indicate hot spots detected by ASTER’s thermal infrared bands. These hot spots are the newly formed fissures and new lava flow as of May 6. In another image taken by ASTER, the massive sulfur dioxide flume is shown in yellow and yellow-green. A smaller but thicker gas plume can be seen coming from Kilauea. The prevailing trade winds are blowing the plumes to the southwest, out over the ocean. Kilauea is the youngest and southernmost volcano on the island of Hawaii, and is one of the world’s most active volcanoes. Eruptive activity along the East Rift Zone has been continuous since 1983.